This side dish is so very easy to prepare and so very tasty. I love cauliflower and it is readily available throughout the year and is a member of the high fiber food club. While cauliflower may not be very colorful it is one of the healthiest foods out there. This member of the cabbage group is vitamin-packed , high in anti-oxidants, contains anti-inflammatory benefits, increased blood flow and is low in carbs and fats. Granted I am adding some fat here with the parmesan cheese but the cheese packs a wallop of flavor to this dish. 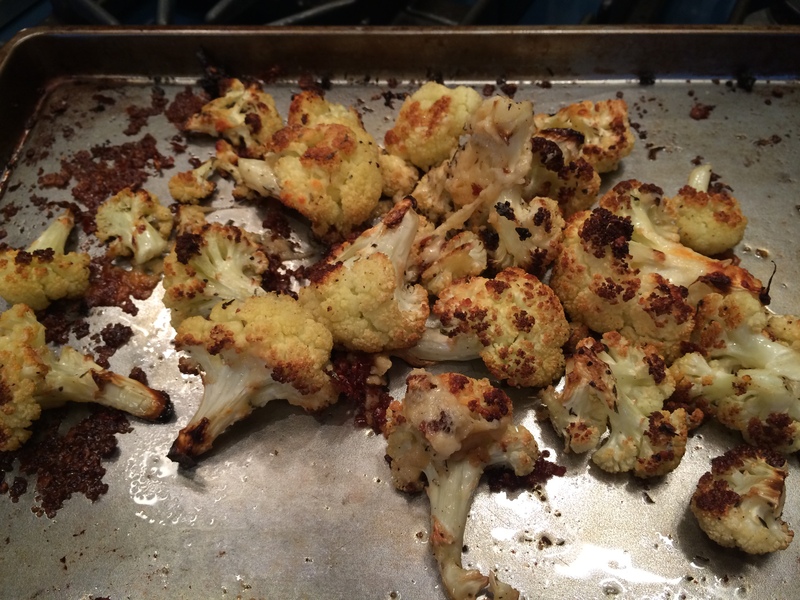 Cauliflower is also good just roasted with olive oil, salt and pepper, and you can always add some other spices. No special equipment required here and not a lot of ingredients. Just a nice sharp knife to cut the cauliflower into florets and a large rimmed baking sheet. Cut head up into florets , try to get them as uniform as possible. The very little ones will burn up. 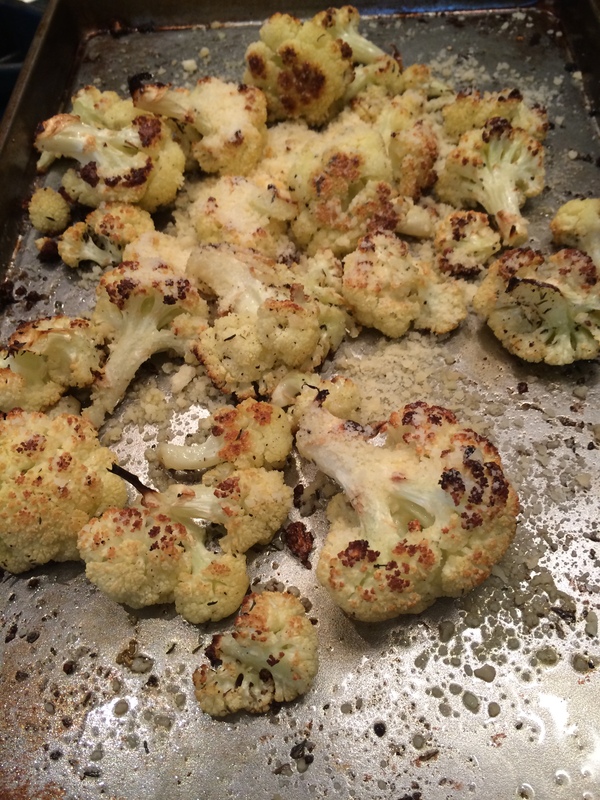 Put cauliflower on a large rimmed baking sheet add sliced onion if you like, thyme , garlic and olive oil. Season with salt and pepper. Roast cauliflower for about 30 minutes tossing occasionally, you just don’t want one side to get too burnt, so check in on it. Toss it around so it gets browned and softened. After the first 1/2 hour if cauliflower is looking a bit browned and softened enough sprinkle with the grated parmesan. 1/2 cup should be fine for a large head of cauliflower. I used 1/2 cup. Toss to combine and cook for another 10 minutes or so. A-mazing, I think I ate 3/4 of the head of cauliflower myself! This entry was posted in cauliflower, sides, vegan, vegetables, vegetarian and tagged Cauliflower, high fiber cauliflower, parmesan roasted cauliflower, Roasted Cauliflower. Bookmark the permalink. 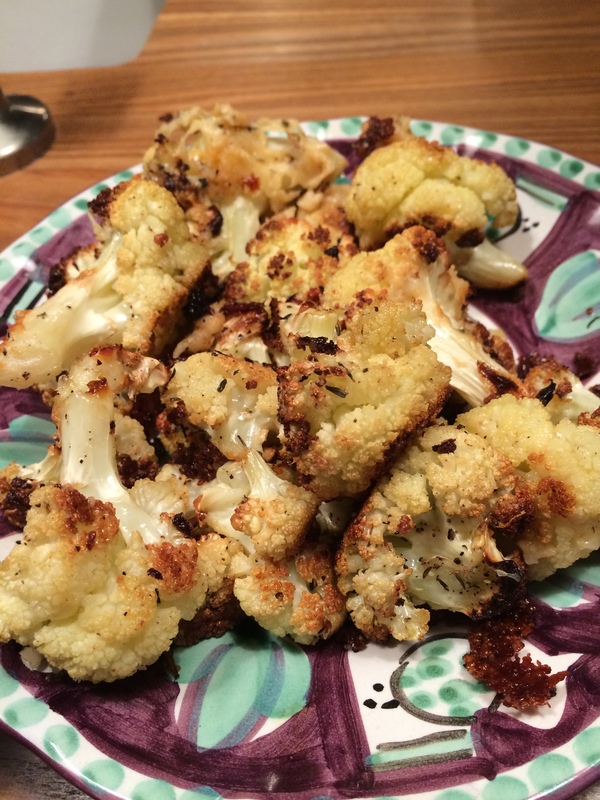 Looking for a delicious side-dish with cauliflower? This is a hands down winner . If you missed this the first time around here’s another shot at it. Of course if you don’t like cauliflower don’t even bother reading but if you’re like me and can’t get enough of this vegetable this one’s for you. It’s simple and delicious. Enjoy!